Such a special day with so many memories! But you need somewhere to keep them all safe. 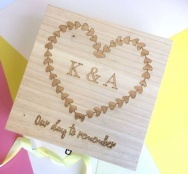 We have the perfect keepsake box that can be wonderfully personalised. As a wedding gift or for yourself, it's perfect.